Crowns are effectively a ‘thimble’ that go over your existing tooth. They provide protection from further damage and improve the appearance of your teeth. A crown is usually required if the tooth can’t be repaired with a filling or inlay/onlay. They can be made from metal or a mixture of metal and porcelain and generally take around two weeks to be constructed. Inlays are laboratory made restorations which are often stronger than a normal filling. 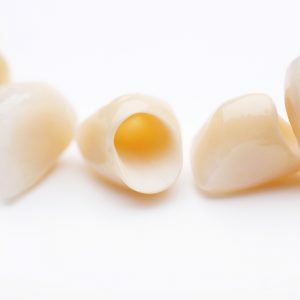 Inlays are a less destructive way to restore a tooth than with a crown and are often used as an alternative treatment method. Gold is the material of choice, however using resin to colour match the rest of your teeth is generally preferred.